The Art Deco era roughly coincided with the decades between 1920 and 1940, although examples of Art Deco design can be found from earlier and later periods. Art Deco was in part a reaction to the sinuous naturalism and eclectic historicism of earlier styles. But, even more, Art Deco was a reflection of the optimism, the sense of newness of a world entering the post-World War I period. Common Art Deco themes include dramatic sunbursts, stylized flora and bold geometric forms. The cufflinks pictured above are a nice example of the latter. The bold, sculptural tops are set with rich green step-cut Tourmalines. The color and cut of the gemstones beautifully complements the design of the cufflinks. Created by Larter & Sons in 14kt gold around 1930. Stylized palmette and water lily cufflinks, circa 1920. From slightly earlier in the Art Deco period, the above white gold cufflinks feature dramatic anthemion corners and borders of stylized water lilies. In early Art Deco cufflinks, flowers and plants were rendered in stylized form. It was a movement away from the wild, untamed plants and vines celebrated in Art Nouveau and late Victorian designs. But as the Art Deco period progressed the stylized flora withered and were replaced by the abstract, more austere designs of the later Art Moderne. One school of Art Deco design followed the motto "Leave no surface undecorated." This exuberant pair of Frank Krementz cufflinks illustrates the finesse with which Art Deco jewelers could work a profusion of decoration into a very small area. The centers feature dramatic sunrises bisected by bands of black enamel and white gold. 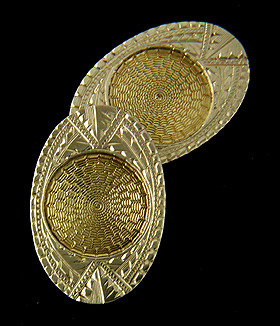 Surrounding the central motif is an oval course of engraved yellow gold with mille grain edges. 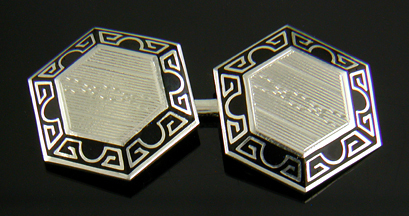 The cufflinks are finished with white gold borders of repeating sunrise motifs. Ziething jazzy cufflinks, circa 1925. A discussion of Jazz Age cufflinks would be remiss if it failed to mention the bright, glittering cuff jewels of Ziething & Company. Ziething created mesmerizing links engraved with an almost obsessive level of detail. The cufflinks are embellished with radiating starbursts, bold geometric patterns and intricate designs. Ziething cufflinks are particularly beautiful in the flickering light of a candle. The above pair was crafted in 10kt white and yellow gold, circa 1925. Dramatic black-and-white cufflinks, circa 1930. Many Art Deco jewels featured vibrant gemstones or rich colored enamels. 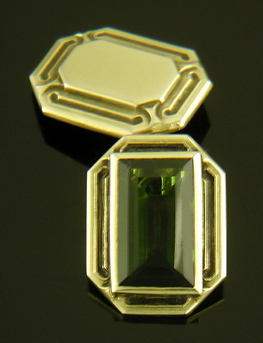 The tourmaline cufflinks illustrated at the beginning of this note are a wonderful example. The late 1920s saw the rise to a second direction in Art Deco design. Striking jewels emphasizing contrasts between black and white captured the public eye. The above cufflinks feature labyrinth-like Chinese-key motifs highlighted against black enamel. 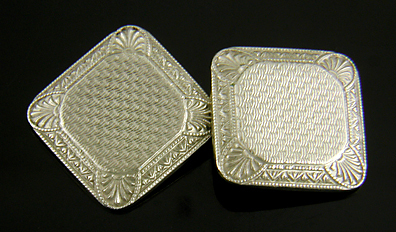 The bright white gold centers are engraved with linear pinstripes. The black-and-white cufflinks of the 1930s are among the most sophisticated and elegant jewels of the era. Wordley, Allsopp & Bliss cufflinks, circa 1925. Wordley, Allsopp & Bliss was a prolific maker of fine cufflinks during the early decades of the 20th century. This pair of Art Deco links achieves a pleasing balance between the exuberant details of the Krementz and Ziething pictured above and the stark elegance of black-and-white designs. The hypnotic centers are surrounded by stippled borders, parallel curved lines and attenuated Chinese-key motifs in black enamel. Crafted in 14kt gold, circa 1925. "Architectural" cufflinks by William Huger, circa 1930. In closing, I illustrate a pair of cufflinks from one of my favorite makers during the Art Deco era, William Huger & Company. The firm embraced the aesthetics of Art Deco design and created beautiful jewels of the cuff. The cufflinks are imbued with the same spirit that inspired America's largest contribution to Deco design - soaring, modern skyscrapers. The above Huger white gold cufflinks feature stylized blossoms, geometric meanders and soaring pinstripe centers that bring to mind the Chrysler Building, Rockefeller Plaza and the other outsized icons of American Art Deco. The successful celebration of Art Deco in both the smallest and largest of objects is a witness to the styles nearly universal appeal. Recent additions to the Antique Cufflink Gallery include a striking pair of Art Deco ovals by Wordley, Allsopp & Bliss, beautiful blue guilloche enamels set in gold, Art Deco black-and-white cufflinks from Kohn & Company, and a jazzy pair of Ziething octagons. Art Deco Ovals! Striking Art Deco cufflinks with a variety of design motifs ranging from hypnotic centers to the dramatic black enamel accents just inside gold dimpled borders. Crafted in 14kt gold, circa 1925. Regal Blue! A regal pairing of blue and yellow. Elegant gold cufflinks with translucent blue enamels. Beneath the enamels is an intricate guilloche pattern of radiating stars or suns. Crafted in 14kt gold, circa 1920. In Black and White! Dramatic engraved pinstripes with contrasting black enamel bands and elegant Art Deco borders. Crafted in 10kt white gold, circa 1930.
stick pin to the Antique Jewelry Gallery.